Fourth Row Center: Film Writings by Jason Bailey: In Theaters: "The Invention of Lying"
Ricky Gervais and Matthew Robinson’s The Invention of Lying is nothing if not ambitious; it tries to work as a) a high-concept gimmick comedy, b) a religious satire, and c) a romantic comedy/drama. Well, two out of three ain’t bad, I guess. The first movie is the one that’s being promoted in the film’s ads and trailers; it takes place in an alternate universe where no one has ever thought to lie. As a result, everyone is brutally, and sometimes painfully or uncomfortably, honest. Gervais (creator and star of the original British version of The Office) plays Mark Bellison, a screenwriter for “Lecture Films” (since no one can make anything up, motion pictures consist of people reading about historical events). Mark is about to lose his job and can’t make any headway with Anna (Jennifer Garner), the girl of his dreams, who is bluntly dismissive of any future together because of his poor genes. When he gets fired and can’t make the rent, he has an unexpected idea during a visit to the bank—he tells the teller that there’s more money in his account than there is. She cheerfully hands over as much as he asks for. Mark realizes he’s on to something, and finds out what it’s like to live life as the one man who’s capable of stretching the truth. 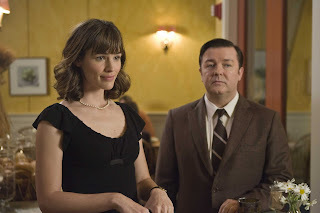 This first act is sharp and consistently clever; Gervais and Robinson (who co-wrote and co-directed) find inventive ramifications for this particular reality, including how total honesty would affect advertising (“Coke: It’s Very Famous”; “Pepsi: For When They’re Out of Coke”) and other elements of everyday life (a rest home is called, simply, “A Sad Place For Hopeless Old People”). Then it maneuvers a tricky mood change. Mark’s mother is on her deathbed, and in order to comfort her, he manufactures a story about how she won’t “disappear into nothing” when she dies—she’ll go to a wonderful place where she’ll live in happiness with everyone she loves, for all eternity. Well, word gets out, and suddenly everyone wants to know about the place where you go when you die. The deathbed scene is a serious one, and while the tonal shift is a touch jarring, Gervais manages to pull it off with his performance (surprisingly strong). But as he is pressured to explain “what he knows,” and finally addresses the teeming masses to tell them about the “man in the sky,” it suddenly dawns on the viewer that the film is subtly making a fairly radical, and undoubtedly controversial, statement: that religion is, in fact, a lie. Hmmm, wonder why they aren’t putting those scenes in the trailers? But that scene, where Mark lays out the dogma, is one of the more sophisticated pieces of religious satire we’ve seen in many a moon. Sure, some of the jokes that surround it are cheap and easy (like his use of pizza boxes as Moses-style tablets, or the Jesus beard-and-hair sight gag), but it’s a funny notion, no matter how much it may alienate some viewers, and Gervais gets some of his biggest laughs through his improvised notions and interactions with the rather thick crowd. Soon Mark is world-famous, but his wealth and power can’t convince Anna to give him a real shot. And here’s where the movie shifts again, into a semi-serious romance, as he watches Anna’s courtship with his biggest rival, Brad Kessler (Rob Lowe), who is rude and unsupportive of her, but boy will they make some pretty babies. The problems with the Mark/Anna romance, which consumes most of the third act, are multifold. First, despite Garner’s best efforts (she really does have some fine moments), the character is given so many opportunities to hurtfully reject Mark that she ultimately becomes rather unlikable. More pressingly, the tone of the romantic scenes is all wrong—they’re played as big, sometimes maudlin encounters, full of open-hearted confessions and tears and so forth, and they just don’t fit in with either the broad comedy of the first act or the sharp satire of the second. Instead, the picture clomps into some awfully well-trod territory, complete with Mark’s voyage to Brad and Anna’s wedding. Any guesses what happens there? It’s rather a shame that The Invention of Lying falls apart as it does; it’s got more great scenes than many far better pictures, and the comedy all-star team that Gervais assembles (Louis C.K., Jonah Hill, Tina Fey, Jason Bateman, Christopher Guest, John Hodgman, Jeffrey Tambor, Nate Corddry, Martin Starr, and Edward Norton and Phillip Seymour Hoffman, both uncredited) is mighty impressive. It’s worth seeing for what it gets right, though with a bit more discipline, Gervais and Robinson might have come up with the great movie they were clearly striving for. "The Invention of Lying" is currently in theaters.